a new anthology of White House history, in the form of illustrations, nonfiction writing, short stories, poetry, texts of actual speeches, transcripts of television interviews, and "illustration essays." 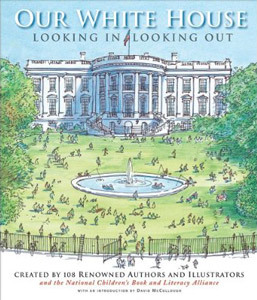 It includes an amazing collection of work from over 100 award winning children's authors and illustrators, as well as, historians and former White House employees and residents. It is a great place to help our kids dig deeper into the history of our country during this historic election year. Also, check out the official website.